There are different ways to recover mailbox database. You can recover the volume where databases are stored or you can recover single database instead of recovering all available database. 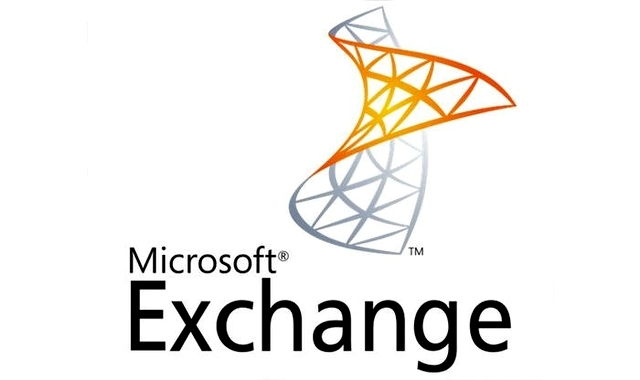 Similarly, you also have option of recovering standalone Exchange server. You can use Windows Server Backup to restore mailbox database in Exchange 2016. Scenario: Exchange server is working fine, but for some reason the databases doesn’t mount. After digging a little bit, you find that the drive where mailbox databases are stored have crashed. Here we can recover all mailbox databases from the backup. You can use this method if the volume where database were stored have now crashed. This method is also used if Exchange server have just been recovered using /RecoverServer switch. 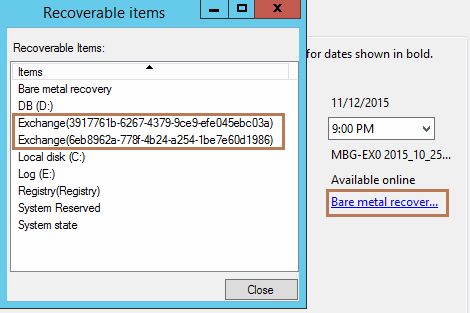 In the scenario, we have Exchange server (MBG-EX01) with two databases in D drive and transaction logs in E drive. The D drive has failed and is replaced with fresh new drive. Now we need to recover database to this new D drive from the old backup. The latest full backup ran by Windows Server Backup is stored in backup drive. Log on to MBG-EX01. Open Windows Server Backup application. Right-click Local Backup and click Recover. Choose the location where backup is stored. In this case it is stored in this server in backup drive. Choose This server and click Next. Choose available backup. You can see the details of the backup as shown above. The date, time, location status and recoverable items. You can click on recoverable items link to view details of recoverable items. As you see above selected portion is two different mailbox database. You can verify by type following cmdlets in EMS. 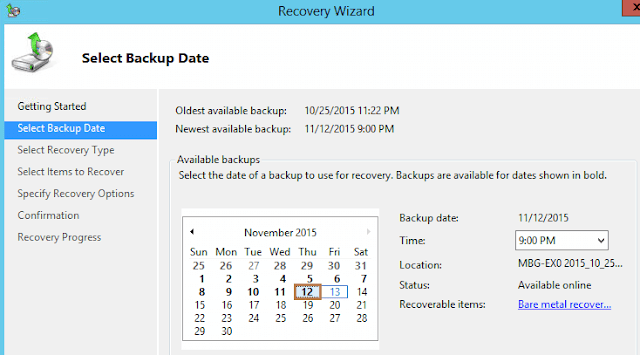 In the Select Backup Date page, select the available backup above and click Next. 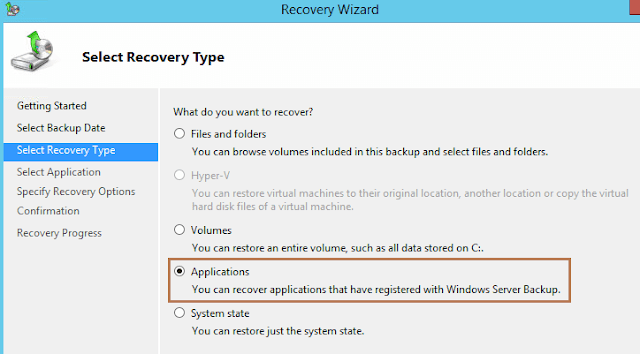 In the Select Recovery Type page, choose Applications and click Next. You can also choose Volumes which will recover the drive. But with applications you have option of roll forward. In the Select Application page, select Exchange. You can click View Details to view database information as shown above. These two databases will be restored. By default Exchange server will try to roll forward by committing all uncommitted transaction logs. Remember we have transactions logs in E drive, we are recovering D drive. So after the failure of D drive, new emails are stuck in transaction logs in E drive. So to let these emails go to mailboxes we need to roll forward the application database. So uncheck the option and click Next. 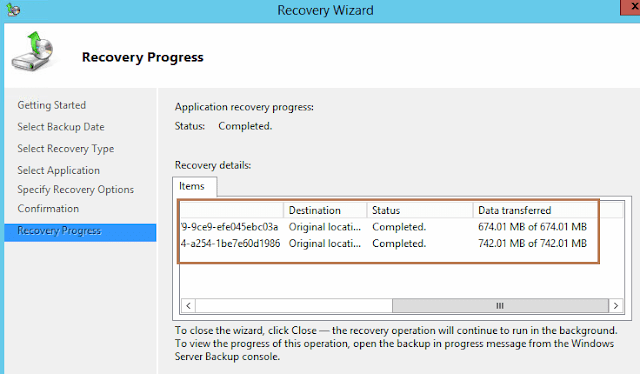 In Specify Recovery Options page, choose recover to original location option. Click Next. Review the confirmation page. Click Recover. The recovery progress will begin. Click close after it is completed. Now let’s verify if the database is mounted. Get-MailboxDatabaseCopyStatus can be used to know about database status as shown below. As you can see above the database is mounted and is healthy. In this way you can recover mailbox database using Windows Server Backup application.